Installment #5 of new-to-Vancouver Nicole Scherleitner's blog 'The adventures of the purple suitcase' brings her to California and back. It is now three months since I moved to Vancouver. Soon after arriving, I got a part-time job in between projects that I had to give up as to not miss out on any opportunities in Vancouver’s film industry. Having a part-time job a good option for some extra cash to cover the main expenses, but there were too many occasions where I would have to postpone shifts last minute because of film projects that were offered to me at the last minute, and in the end it just wasn’t fair to my employer. Thankfully I have some money saved up to cover rent and my daily expenses if I don’t go overboard. The jobs are still periodic. One week may be filled with crazy long hours and very little sleep, only to be followed with days of doing nothing. Not going to lie, it can be a little exhausting on my time schedule, and frustrating when I don’t know what to do with myself after days of just sitting in cafes reading. But that is the industry I chose for myself, and I just have to keep going until the jobs become regular and days off will feel relaxing rather than frustrating. 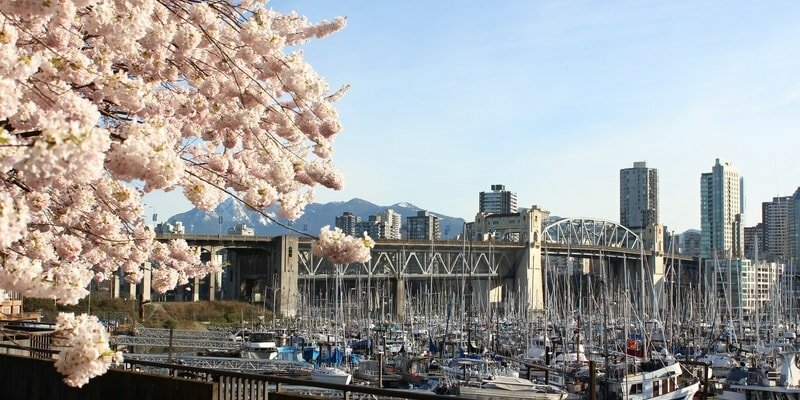 Gaps between film projects means more time to enjoy spring in beautiful Vancouver, BC. The good thing about all this free time is that I got to take a two-week vacation. I know, it’s very early on into my time here in Canada, but my mom (also working in the film industry in Austria in the HR department) will have so many projects coming up later this year that we weren’t sure if we would be able to see each other again before Christmas. So we decided to meet in Santa Barbara, California and enjoy two weeks at the beach while both our schedules were less busy. Nothing feels quite as rejuvenating and relaxing as walking up and down Leadbetter Beach, relaxing by the harbour, watching the waves crash, smelling the salty water in the air, and just taking a minute to be grateful for everything that is happening in my life. California had a surprisingly large amount of rain over the last few weeks, but thankfully it took a break for the days that we were there. And I returned back to Vancouver just in time for pilot season! What a crazy time it is indeed. I got lucky and was hired as an Office Production Assistant for one of the pilots. This is the first time for me working in the office, and I am loving every second of it. When I was around 12 years old my mom took me to California for the first time. We spent a few days in LA, where she took me to the Warner Brothers Studios for one of their tours. The only reason we chose to do that tour was because Gilmore Girls shot there and it allowed us to look at the sets, which was an incredible experience. But the second the tour started and we drove out onto the studios, my little 12-year-old mind was blown. It was pure magic, learning everything that goes behind making something that I would watch cuddled up on my couch. The incredible sets they would build and all these worlds they were creating out of nothing. It really was that day that started this whole dream of me working in the film industry. I cannot describe how grateful I feel to have that dream become reality just a few days ago.. I get to hop onto the SkyTrain and make my way to a production office on a film studio working on a pilot every day with fantastic co-workers. The realization of that dream — a dream I’ve visualized for such a long time — becoming reality is just indescribable. My cheeks are starting to hurt from the constant smiling, and I hope this feeling never goes away, no matter how long I will work in this industry. So cross your fingers for me that our show will be picked up and I get to do this every day.